The snow is beginning to fall and blanket the world in white. The weather is cold, the leaves are gone, the ground is beginning to freeze. The Earth still possess its surface warmth, melting the snow as it first begins to accumulate. Our collective culture's retain this warmth through traditional practices that increase our spiritual warmth in December. Christmas, Hanukkah, Kwanzaa, and the winter solstice remind us the importance of drawing together as a community to find comfort and joy in the warmth of spirit. This is a joyous time of year. In the depth of winter we have many external reminders that we can fill our lives and cups with love, kindness, compassion, and spirit. One of the challenges of the winter, amidst the cold, dark days is to remember that we internally possess the spark of fire. "When the weather outside is frightful", Our fire can be so delightful". The warmth of Spirit, the power of the heart. This holiday season, when the days become short and when the nights become long, remember that we have the ability to use our Fire to combat Ice. We can cultivate the attitude of bringing warmth to the depth of winter. Will you choose to illuminate the cold night with the bright spark of your Spirit? As in all aspects of Chinese medicine, we are asked to contemplate the nature of Yin and Yang. The existence of opposite states and their interrelationships and transformations. Fire and Ice, Summer and Winter, the relationship between our Hearts and Kidneys. The Kidneys in Chinese medicine is reflected by the water element. It is the deepest organ system responsible for our back, knees, bones, reproduction, urination, marrow, and the ability to be self-reflective. The kidneys represent our deepest connection to our source, to our innate divinity. The power of the kidneys provides us a Willingness to embrace the cold storms of life and continue forward towards the fulfillment of our destiny. The location of the kidneys, the two bean shaped organs positioned at the lower back infront of the spine, provides us a place for contemplation and centering. The Dan Tien, is defined as the space between the kidneys. This is our physical center of gravity. With a left-yin and a right-yang kidney, they work together as an energetic battery. The two aspects of the kidney provide a deep resource of fuel as well as the spark plug that are used to ignite our bodies energetic system. The Kidneys, defined by the nature of water, like to keep things moving. They can easily be frozen in fear where our ability to interact and move prevents us from engaging in the world. It is imperative to keep the energetics of the kidneys warm and active. In the winter, in the time of the Kidneys, we must place fire into water. We must allow the warmth of our heart and spirit to invigorate and thaw the bitter, coldness of our lives. Breathing deeply and reflecting on warming our lower abdomen, we have a powerful tool for melting the ice and keeping the Kidneys active. As we breathe and direct the warmth of our hearts downwards to our Kidneys we learn to release the past and become very present in his moment. The image of placing Fire into Water. Placing the hot coals of Spirit into the depths of our being to warm up and transform our lives. As Fire and Water combine we begin to increase the temperature of our body, mind, and spirit. Practicing this meditation brings one a deeper ability to regulate our bodies thermostat, increase metabolism, and ground emotional situations. More importantly, as the stress of the holidays tends to build, we have a tool for being more present. 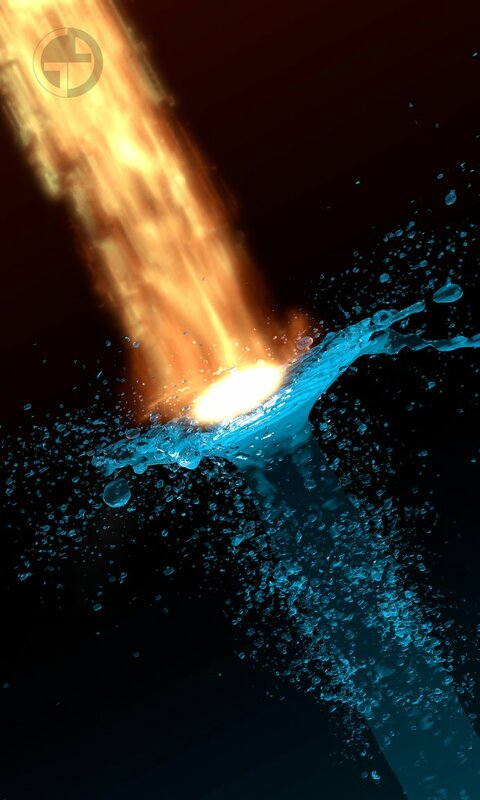 As the Fire of our lives flares, we require water to quell the flames. Our Heart and Kidneys require constant communication for us to remain balanced in our lives. Fire and Water must remain in equilibrium. The language of Chinese medicine was created to provide us stories and metaphors to contemplate. As a system of living philosophy, the practices of Chinese medicine teach us to find balance within ourselves and environment as we move through the many seasons of life. The practice of drinking tea requires that we bring Fire into Water. For us to extract the proper flavor of the leaf, we need to warm the water to the perfect temperature so that this transformation occurs. Tea meditations ask for mindfulness of every step in the tea making, serving, and drinking practice. As you warm your tea this holiday season, practice bringing warmth to your Kidneys. As you serve tea to your family and friends, practice sharing the spark of your Heart-Fire with your community. As is above, Is below. What is found outside, is found internally. The many physical gifts of the seasons can be empty without the warmth of our friends, family, and community to share it with. Moving through this wonderful season, we challenge you to share your mindful Presence with the world by bring Fire into Water.